I live in a hard water area and one of the most annoying things are the stains and rings in the toilette bowls. Until now I thought the only way to combat them was with special cleaning products. Vinegar to the rescue! Hard water contains calcium, magnesium and manganese which combine with carbon dioxide from the air to form insoluble carbonates, the same stuff stalagmites and stalactites in limestone caves are usually made of. Given enough time the deposits can grow considerably. Soap and detergents don't remove them because they are not water soluble. They must be disolved with an acid. 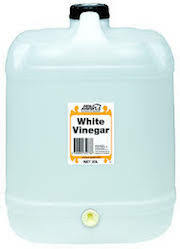 Household cleaners usually contain the very potent and toxic hydrochloric acid but safe vinegar works just as well, if somewhat slower. There is no need for fancy apple cider or wine vinegar, all you are interested in is the acetic acid and the cheaper white distilled vinegar is perfect for the job. To clean a toilette bowl follow these simple instructions. Flush the toilette to make sure it's full of clean water and no solids. Add half a cup of white vinegar. Scrub the bowl lightly with a toilet brush to spread the diluted vinegar to all the areas with spots and stains. Repeat the scrubbing two or three times at quarter hour intervals. You can actually see the stains dissolving. After an hour the job should be done unless you have very heavy deposits. Scrub the bowl one last time and flush the toilette. Pots and pans used to boil water or for long cooking legumes like beans can use a similar treatment. After use clean as usual with soap and water. Instead of drying, add a splash of white vinegar, swish to moisten all the stains and let it stand for an hour. Scrub lightly with a scouring pads, rinse and dry. There is no need to use harsh hydrochloric acid which is not just dangerous but it will eat the metal drain pipes doing long term damage to your home. Last updated April 3, 2016.